5 Signs You’re In A Relationship With An Enlightened Individual. Some might say that it’s difficult, or even rare, to find people who are enlightened in the world today. But, when you do find one, you’ll know it. Enlightened individuals see the world differently. They’re confident, yet humble, and have an air about them that suggests they’ve got this life thing down. 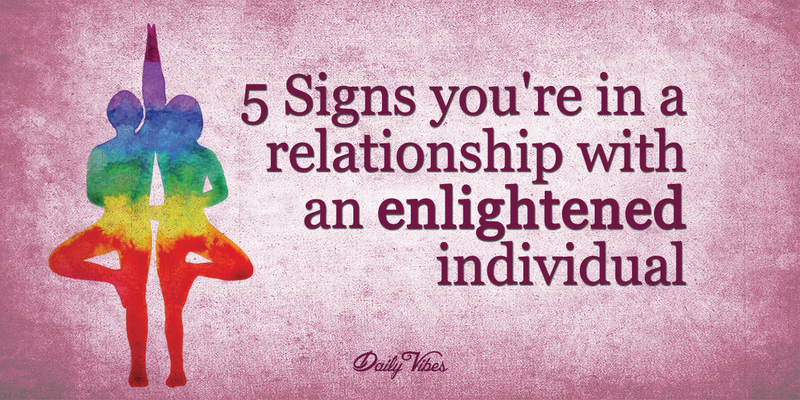 Enlightened people know how important it is for them to spend time each day reconnecting with themselves. Whether it’s through meditation, yoga, or simply going for a long hike in the woods, they love disconnecting from the fast-paced world of work and friends in order to tune into the world that exists within their heart and soul. Enlightened folks, being highly aware of who they are, know exactly what they want out of life, and they really don’t care if anyone disagrees with their desires. This is not to say that they will completely ignore a person’s sound advice or ideas; they’ll listen respectfully, but at the end of the day, they’re going to continue believing in themselves, regardless of what others have to say. Enlightened people recognize that their lifestyle may not be the most popular choice or something that everyone else wants to do, but they prefer it that way. They gain validation from within, rather than through what the masses are doing or saying people should be doing. If they can live a life that is true to them, that’s all they concerned about. Even when enlightened people are interacting with a person they’re not particularly fond of, they still choose to exhibit kindness and genuine respect. This is because they understand that everyone on this planet is different. Each one of us has been carving a path that is unique to us, so there’s no sense in judging others for the way they live their life. Most of the time, stepping out of one’s comfort zone and confronting change is one of the hardest things a person will ever have to do. Enlightened folks see change as a good thing, because with change comes opportunity and growth. They also recognize that there’s no sense in trying to predict where you will be in the future, so you can’t try to control it either. Each obstacle we overcome or poor situation we find ourselves in comes with a lesson to be learned.